We build custom single slip, double slip, and platform floating docks for our clients. Our docks are of the highest craftsmanship and are built in either Aluminum or Steel. Below is more information into our materials and their benefits. Master Docks Floating Docks are ideally suited for complex layouts and commercial as well as residential use on deep-bottom lakes, reservoirs and rivers. Floats automatically adjust to high and low water conditions, so you’ll never be left high and dry or find your dock submerged. our floating Docks feature the same advantages found in all our docks – low maintenance, custom build, durability and expandability. 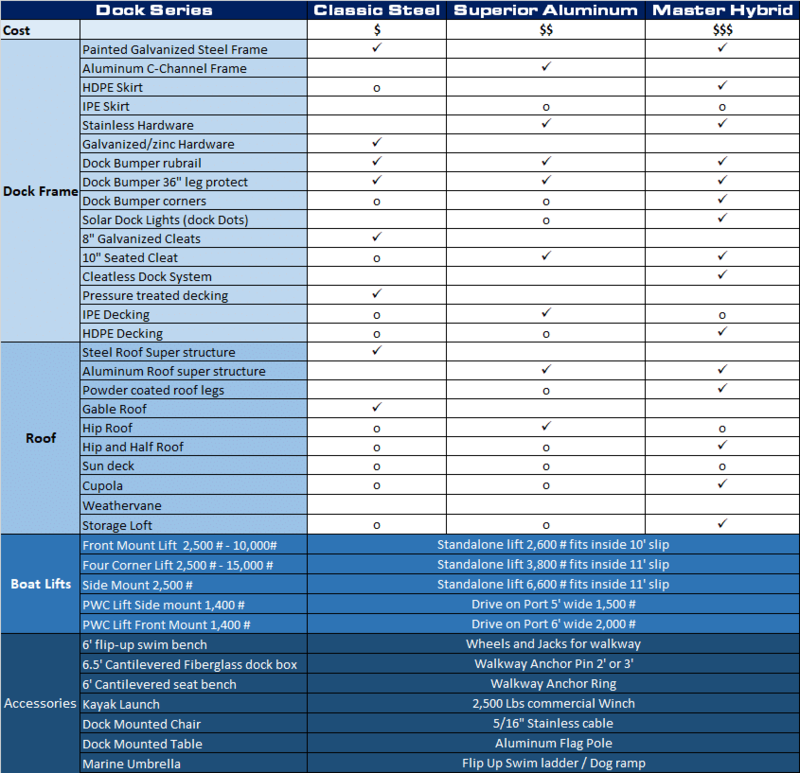 Whether you choose aluminum for low-weight or galvanized steel for maximum strength, Master Docks Floating Docks are engineered and constructed to provide unexcelled performance and durability. Aluminum Docks are the go-to for maintenance free lakeside living. While more costly than Steel or wood, our Aluminum docks are durable, high quality, modular floating docks that can be completely customizable. All are designed in our warehouse and pieces welded in place at your dock location. Steel Docks are a great option for those on a budget. While not as maintenance free & durable as Aluminum, Steel docks are still fully customizable & welded on location. Steel is heavier than aluminum and are a great choice for open water with lots of wave action. The weight of the dock will keep it more stable. With Steel, you can still customize your dock as desired from custom roofing, walkways, & decking to a variety of accessories. We also provide boat & PWC lifts so your dock can fit all your boating needs. Contact us today to get a free consultation to help you guide you through the differences in our products, pricing, and services.